Poll: Should Theresa May be forced to step down as PM? British media has reported on a ‘cabinet coup’ which aims to force May to resign. 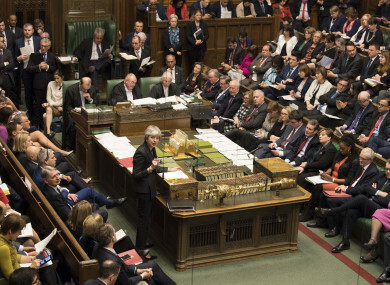 AMID REPORTS THAT ministers are engaged in a “cabinet coup” to force Theresa May’s resignation, supporters of the Prime Minister have said it won’t help the Brexit process. Two British newspapers have reported that a number of cabinet ministers want May to step aside to make way for someone else. Chancellor Philip Hammond told Sky News this morning, however, that the idea of ousting May is “self-indulgent” and that parliament “has to come together” to make a decision on Brexit. So, today we’re asking: Should Theresa May be forced to step down as PM? Email “Poll: Should Theresa May be forced to step down as PM?”. Feedback on “Poll: Should Theresa May be forced to step down as PM?”.